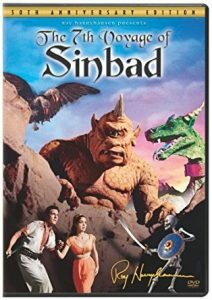 The 7th Voyage of Sinbad is best remembered as a Ray Harryhausen special effects extravaganza. 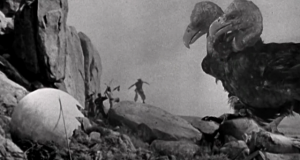 And as a huge fan of Ray Harryhausen’s work, I certainly appreciate the great work that he did here. But a film has to be more than special effects; and thankfully, this film is more than great special effects. The acting is good, with characters that the audience care about. Also, the effects enhance the story and don’t take it over. The 7th Voyage of Sinbad begins with the famous sailor Sinbad (Kerwin Mathews — Jack the Giant Killer, The Boy Who Cried Werewolf) and his crew find the island of Colosse where they encounter Sokurah the magician (Torin Thatcher, Witness for the Prosecution) fleeing from a giant cyclops. They escape with their lives, but Sokurah loses his magic lamp in the attempt. The magician asks Sinbad to go back for it, but the sailor refuses since his lovely fiancee Princess Parisa (Kathryn Grant — Anatomy of a Murder, The Big Circus) is on board; their upcoming marriage will cement peace between their respective kingdoms. Never underestimate the wiles of an evil magician, however. He shrinks the princess via magic. He then claims that she can only be restored with ingredients from the island where his magic lamp left behind … And the genie of the lamp, Barini (Richard Eyer, The Invisible Boy, Friendly Persuasion) bonds with the shrunken princess. Sultan: [upon seeing Sadi as the Magician’s subject] Is that not Sadi, your waiting woman? Princess Parisa: Yes, papa. She has offered herself as the Magician’s subject. Sultan: If he can turn her into a contented woman, he is indeed a great magician. It’s an incredible cinematic adventure as the legendary Sinbad sets off on a dangerous journey to the mysterious Island of Colossus. His quest is to break the spell cast over his beloved princess by a diabolical magician. But before he can save her, Sinbad must battle an awesome collection of mythical monsters, the man-eating Cyclops, a saber-wielding skeleton, a ferocious two-headed bird called the Roc and a fire-breathing dragon. Starring Kerwin Mathews, Kathryn Grant, Torin Thatcher and highlighted by the stunning visual effects mastery of Ray Harryhausen. Now in a pristine, hi-definition transfer that captures the magic of Harryhausen’s “eye-popping” special effects in dazzling Technicolor. Given the stature of Ray Harryhausen and The 7th Voyage of Sinbad in the history of movie special effects, it’s no surprise that the supplemental features on the film’s 50th Anniversary DVD strike a deeply reverential tone. Phil Tippett and Randall Cook–both effects legends in their own right thanks to RoboCop and Lord of the Rings–pay homage to Harryhausen by joining him on the informative commentary track, which also features Bernard Herrmann biographer Steven Smith and Arnold Kunert. Harryhausen provides a wealth of information about the film’s production on the track, and on a 20-minute interview featurette (produced by Kunert, which showcases some of his original production sketches and the skeleton model Kerwin Matthews battles in the film. More tributes pour in on The Harryhausen Legend, in which directors and effects creators ranging from John Landis and Joe Dante to Rick Baker and Dennis Muren recall how the awe they felt after seeing 7th Voyage helped to steer them towards their careers. Smith is front and center for an informative featurette about Herrmann’s work on Harryhausen’s films and fantasy features in general, while Landis hosts an agreeable 1995 interview with Harryhausen that focuses on his work in Jason and the Argonauts.